It’s interesting how ideas come together sometimes. 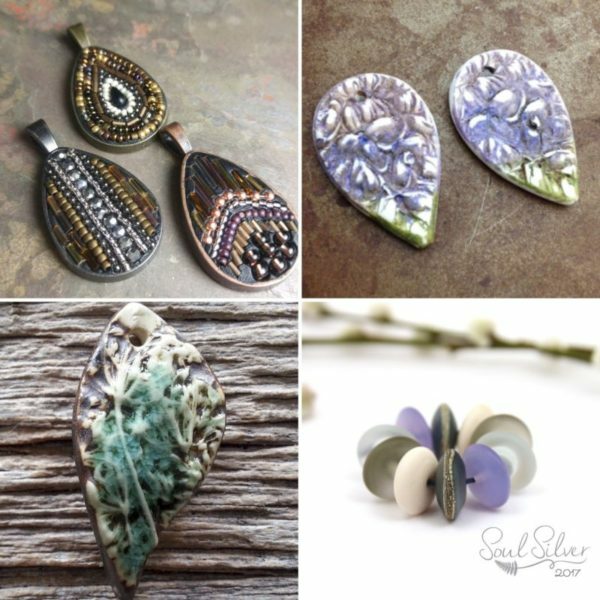 I had started out with a definite plan for this month’s post…tin…all types of tin and colors. I spread my supplies out and began. 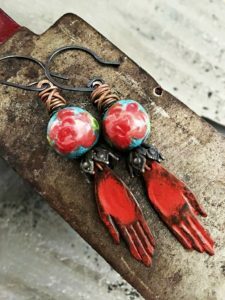 As I was working, I became immersed in the colors of turquoise and red. Rich red roses against the contrast of various bluish-greens. The feature evolved and became more about that beautiful color combination than just tin. I used to be stubborn and hang on to my original ideas for dear life, but, I’ve learned to be more flexible, not fight it, and go where inspiration takes me. Good things happen this way. 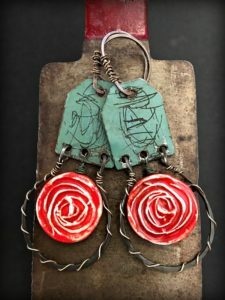 The amazing tin used in this pair of earrings was handmade using authentic vintage decals from Marina Rios of Fancifuldevices. Anyone who knows me, knows I’m a lover of vintage and sprinkle it in my designs wherever and whenever possible…lol The flower decals had been applied to both the outside and inside of the blackened tin, which makes them unique and wonderful! 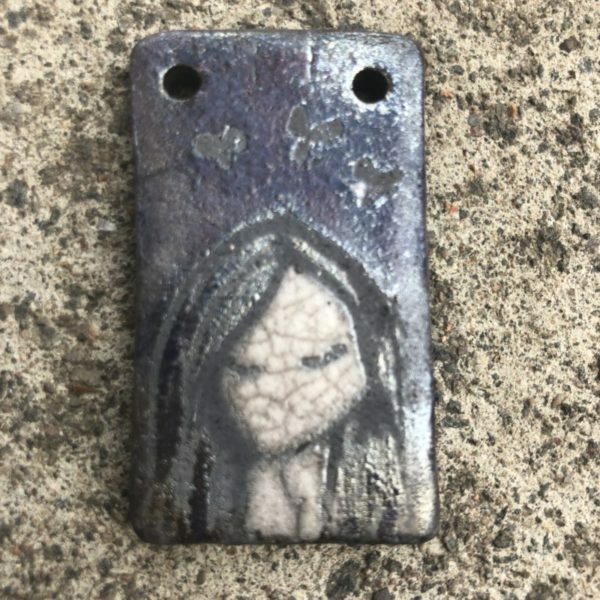 Marina has an excellent tin tutorial available on her etsy page you should check out. 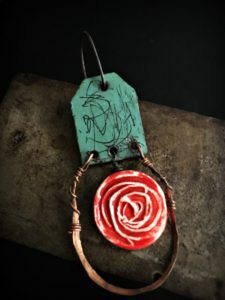 The pieces of tin originally came in an arc shape, but I needed them as hoops. 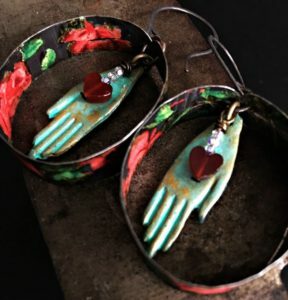 I wanted…I neeeeeded them… to encircle the hand charms from Inviciti. Can we all just take a moment and bask in the splendor of these beautiful hands! ………….. Okay…I know…whew. The tin was thin and lightweight, so I was able to slowly work the arc into a hoop with just my hands and secure with a jump-ring. I wanted to bring some of the rich red back to the center and also for the symbolism of heart-in-hand. I used tiny red carnelian hearts along with bitty little crystals from Swarovski. 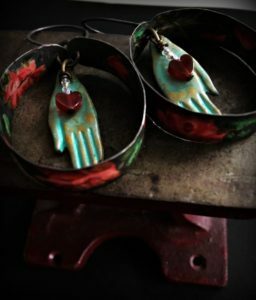 I am over the moon about these earrings! 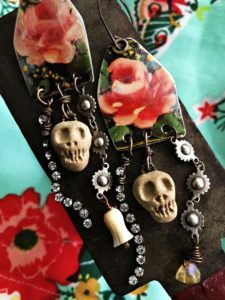 Here are some long sparkling rhinestones, chain, and earthy ceramic skulls from Gaea dangling from roughed up tin by Shipwreck Dandy. Sometimes things you think will be a snap to make, turn into a project..lol So, I will show you two photos, the first being the finished design and the second is what the design evolved from. Below, is my sad little problem child. What a difference the blackened steel made in both strength and color contrast! Here comes the beautiful hands again by Vincent and Nooma Cav of Inviciti! 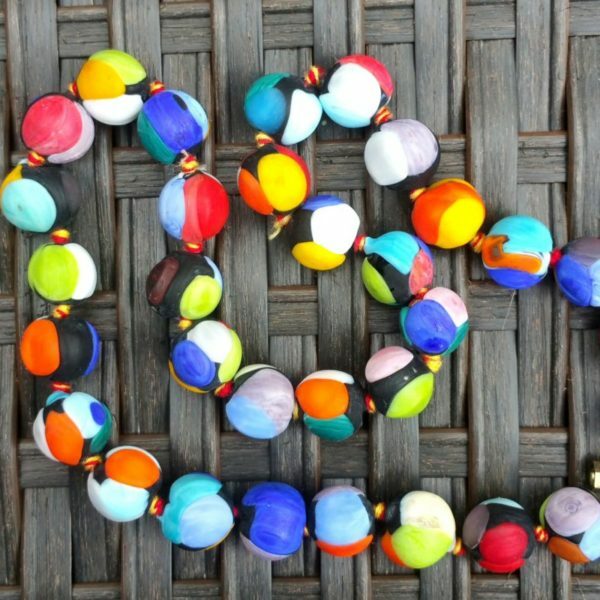 AND, oh my gosh, I found the perfect painterly rose beads to pair with them….right here, under my own nose! 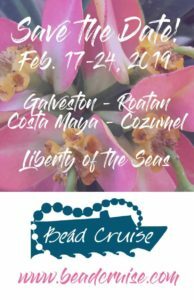 The rose beads are made by Deborah Schlegel of Deborah Schlegel Studio and she is one of our sponsors here at the Art Bead Scene Studio!! You can click the link I’ve attached to her name or find her on our front page. Anyway, wow, I was beyond excited to find these beads and all her work! Well, it’s been a pleasure to meet with you today! 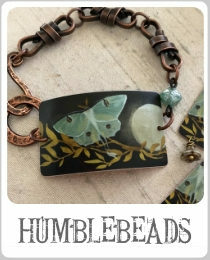 I can’t begin to tell you how much I enjoy doing these blog posts! I love to read your comments and feedback if you have the time! Wowsers how beautiful is this ??!! I really love your tinning!! And all those happy colors !! Very nice. !! Every last pair of these is simply amazing!! I am absolutely in awe of your talent and vision. 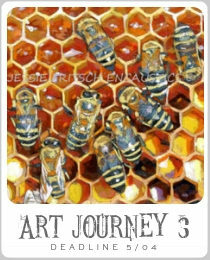 Thank you for sharing this peek into your process. AMAZING!!! So much fun! You never fail to surprise and delight, Loralee! All of these are so beautiful! And so wonderful to see the rose beads used in such gorgeous earrings!! Every time I think you can’t possibly top what you’ve done, you do! 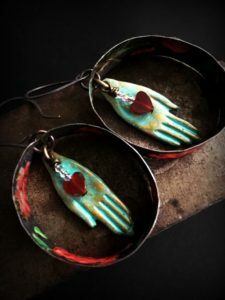 These earrings are just gorgeous. Thank you for sharing your process. It motivates me to know these don’t just pop from your mind and hands fully formed and perfect the first time. 🙂 I love seeing your posts. Fantastic work, Lora! and thank you!